This has been done many times over: the tree, the shoe, the chicken bones, the shenanigans, the recurring themes of seemingly endless waiting – all the things that make Samuel Beckett’s Waiting for Godot the absurdist masterpiece that it is. The UP Repertory Company (UP Rep), however, brings another twist to the literary classic with a staging that runs for 8 hours. On May 5, 6, and 7, UP Rep will engage audiences with the challenge of stepping in an 8-hour devised work of museum theatre featuring elements inspired by the story and characters of Beckett’s play and Rolando Tinio’s adaptation Paghihintay kay Godo. This performance entitled Walang Katapusang Godot shall close UP Rep’s 44th theatre season, OTW. Fifteen (15) actors from UP Rep and various other theatre groups are posed with a challenge of their own: giving life to characters that are “clients” of a mental asylum. The inhumane material conditions, the sense of abandonment, the bleak possibility of experiencing a life outside the asylum walls, and the waiting — always the waiting – will all be recreated for the most realistic theatre experience possible. Audiences will come as “visitors” – mere spectators outside of “madness,” looking in. 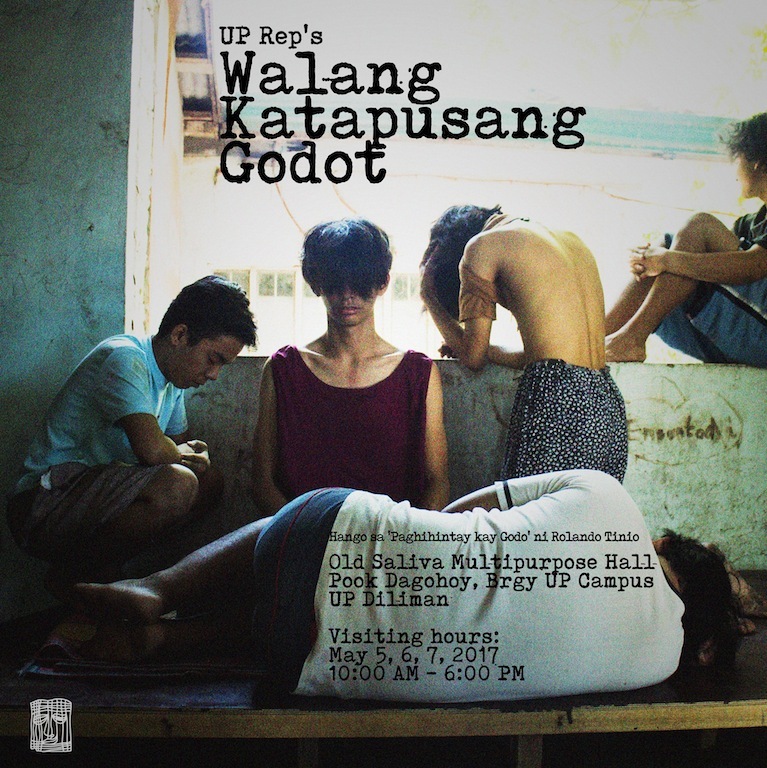 With Walang Katapusang Godot, UP Rep hopes to at least bring forth the consciousness of its audience the people who exist within enclosures because the world they know is different from what the rest of us is used to. Who are these people endlessly waiting for? Are they really as threatening as we make them out to be? Sino ang tunay na baliw? Who is Godo – a Filipino Messiah? Is he arriving anytime soon? Has he maybe arrived already? Directed by Manuel Mesina III, with dramaturgy by Lucia Silva, Malvin Ramos, and Gio Potes, wardrobe by Rainne Setias, and overall production design by Io Balanon, Walang Katapusang Godot attempts to answer these questions and much more as it tackles mental health in the country head-on, no matter how unpleasant it could be. UP Rep’s Walang Katapusang Godot will run on May 5, 6, & 7, from 10am to 6pm at the Old Saliva Multipurpose Hall, Pook Dagohoy, Bgy. UP Campus. For inquiries and ticket reservations, contact Roseball at 09290568205 or 09155330042.